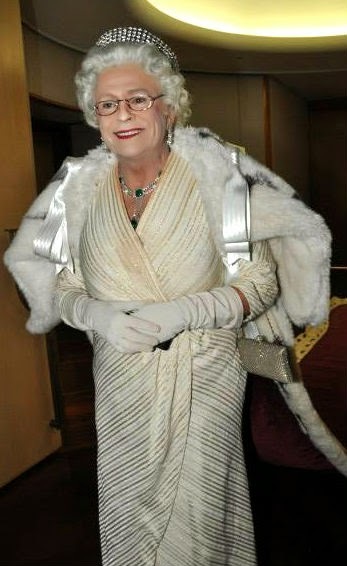 Please watch the video first as an introduction : that's a command from Her Maj, Queen of Australia (UK, Canada etc etc and so on) who is seen in our exclusive snap arriving at the pollies' Mid-Winter Ball in Canberra last week. Joh is a fine horseman himself so he has a great interest in the beasts and when he isn't tending to the locks of Sydney society matrons or visiting celebs like the Duchess of York or movie legend Jane Fonda- seen with Joh in our snap - he's appearing at gymkhanas and horse trials. At present he's moved on from the grand Belgravia mansion he was staying in and is now in Paris. Ain't life grand for some ! ## The Shuttle has attended Ascot twice. Many moons ago we traveled in style in a Range Rover with a good friend Stephen Barry who worked at Buck Palace. Amazingly, Barry's car was waved through at blocked intersections by police as they spotted him bearing down on them. They held up traffic as we sailed past. 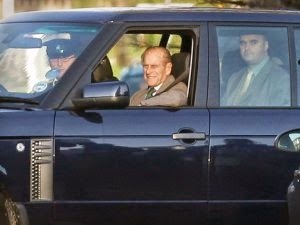 It's then we learned the car was owned by Barry's employer Prince Charles and he had borrowed it for the day. Being painted a special blue supplied by British Paints, a colour reserved for the Royals (right), it's how we discovered that all British police are trained in spotting the special coloured cars to ensure smooth passage of VIPs. Like us. Below is a pic of the Windsor Polo and the Cartier Cup. It's a splendid snap and we love the lady in front. Apparently in one of our snaps is a royal impersonator and in our other snap it's a genuine Royal. We can't tell which is which, perhaps you can!